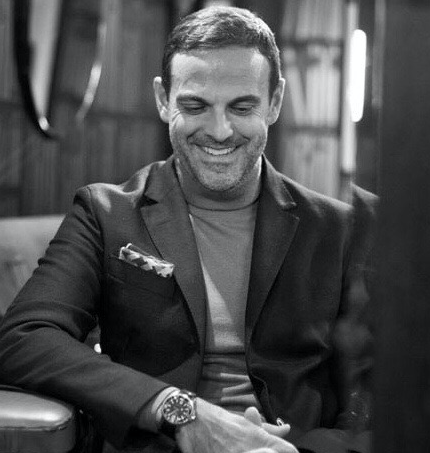 Nick Tentis is the Designer, Owner and Creative Director of Nick Tentis, his luxury menswear label which creates ready to wear clothing, accessories and bespoke tailoring. Nick also acts as Creative Director of Adoreum, bringing his strong creative vision and direction to bespoke marketing projects and events. Nick began his career in 1980s London opening his first shop in Soho, offering vintage English and American clothing. He then went on to offer ready to wear and bespoke tailoring to his growing list of celebrity and influential clients. Soon after this, Nick opened two new stores in Clerkenwell and Mayfair offering ready to wear collections and bespoke tailoring for clients such as Alexander McQueen. He also opened an Atelier in Marylebone and started selling his ready to wear collection in Harrods and department stores in Tokyo. In 2009, Nick opened his renowned shop on Savile Row, Mayfair. This store known for its striking interior based on Stanley Kubrick’s 1968 sci-fi classic 2001, also included a bar, café and barber. Throughout his time on Savile Row, Nick hosted a growing celebrity and influential client list such as Eddie Redmayne, Samuel L Jackson, Martin Freeman, Bryan Ferry, Dermot O’Leary and many more.